Detail of entrance to morthouse showing steps and shelving, Udny Parish Church burial ground. View of morthouse built 1832, Udny Parish Church burial ground. 'Anatomy (Scotland) Act' rendered it obsolete by the simple expedient of appropriating the unclaimed bodies of the poor. 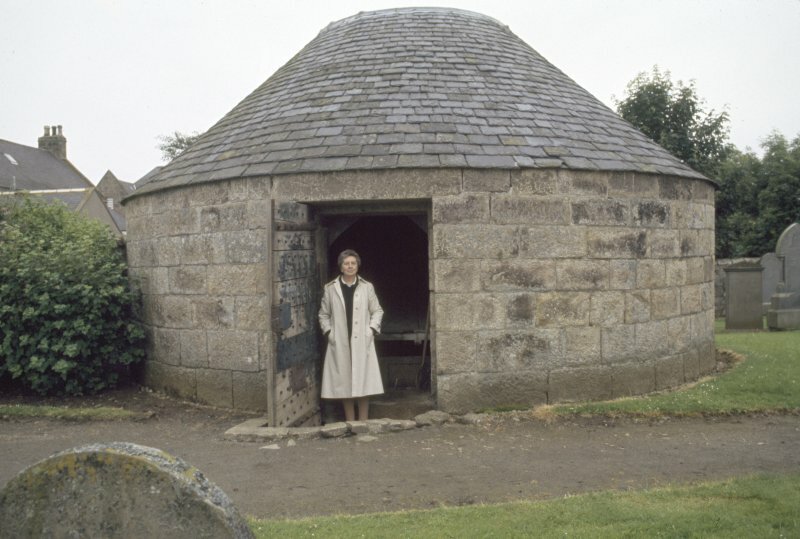 Coffins were placed within the circular, windowless, rough ashlar granite chamber on a platform which was ratcheted round in a minimum of seven days (although the regulations permitted coffins to remain for up to three months). A strong oak door with a lock requiring four separate keyholders and an inner iron door completed the defences. The mason was Alexander Walker and the wright, Thomas Smith. Used as a rifle store in the Second World War. 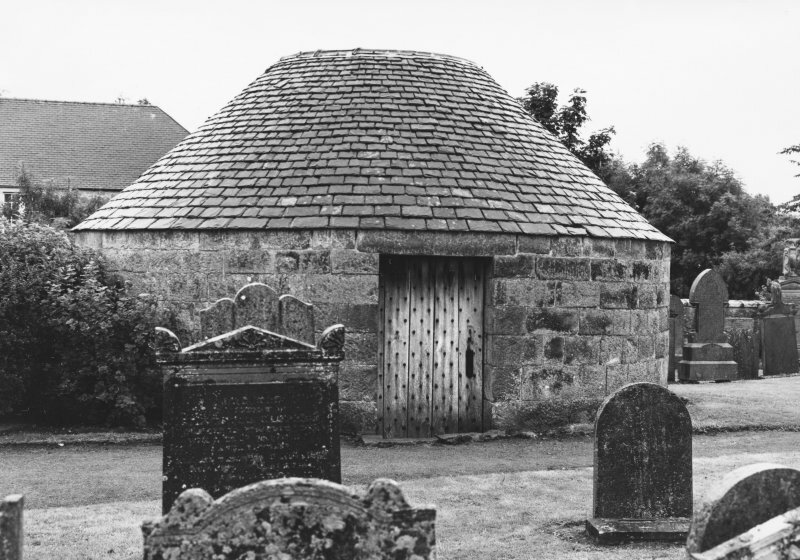 Mort-house built 1832 for Captain John Marr: circular, rough, ashlar granite; conical slated roof truncated and platformed; stout oak door with a protective bar arrangement for keyhole; revolving coffin platform 3ft from floor within. John Marr (Cairnbrogie) was the designer, Alex. Wallace (Smiddyhill) the mason and Thomas Smith (Old Meldrum) the wright. J Ritchie 1912; NMRS, MS/712/80. This plain, circular building could be easily mistaken for a rather substantial toolstore. A second look at its solid granite masonry, its high, slated roof, the absence of windows, and its stout oak door reveals a most ingenious solution to the problem of the resurrectionists or body snatchers. Coffins were placed within the mort house on a turntable, thus postponing burial until the bodies were unsuitable for sale. (Coffins were removed successively, the maxim um period of storage being three months.) Four independent key-bearers were needed to unlock the oaken door and to genetrate the sliding inner iron door. It was designed by Captain John Marr of Cairnbrogie and built for £80 Scots by Alexander Wallace and Thomas Smith in 1832, ironically the year of the passing of the Anatomy (Scotland) Act which ultimately solved the problem by ensuring an adequate legal supply of bodies. The mort house was subsequently used as an ammunition store. This plain, circular building cou ld be easily mistaken for a rather substantial toolstore. A second look at its solid gran ite masonry, its high, slated roof, the absence of windows, and its stout oak door reveals a most ingenious solution to the problem of the resurrectionists or body snatchers. 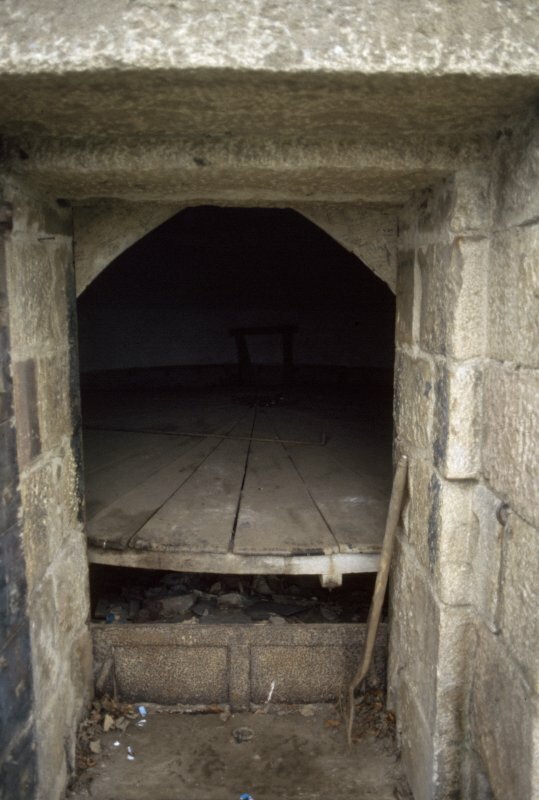 Coffins were placed within the mort house on a turntable, thus postponing burial until the bodies were unsuitable for sale. (Coffins were removed successively, the maximum period of storage being three months.) Four independent key-bearers were needed to unlock the oaken door and to penetrate the sliding inner iron door.